The habitual be: Why cookie monster be eating cookies, whether he is eating cookies or not. 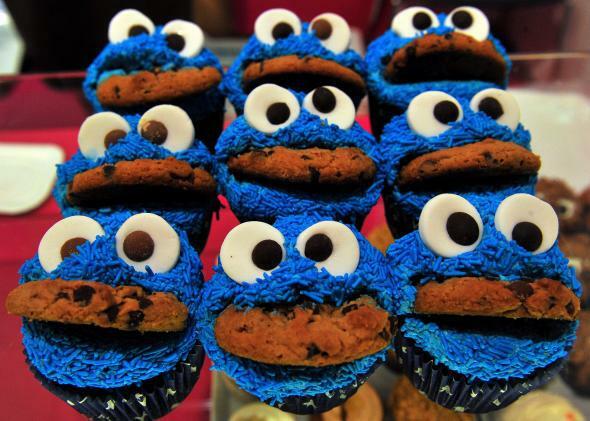 Cookie Monster cupcakes allude to the puppet’s existential state at a Seville bakery this year. Who be eating cookies? That’s the question that the University of Massachusetts Amherst’s Janice Jackson asked children in a now-famous study on “the habitual be.”* Have you heard of this creature? Though it sounds like the yellow jacket perpetually hard at work on your hydrangea, it is not. It is but one way in which African-American English (AAE, to linguists) adds nuance to traditional verb forms, and it is the reason that “she be walking the dog” signifies differently to different listeners. If you are speaking so-called white English, “Mara be walking the dog” means the same thing as “Mara is walking the dog.” If you are communicating in AAE, “Mara be walking the dog” says that Mara customarily walks the dog—that dog-walking has some definitional sway over her daily existence. It doesn’t guarantee that she is out walking the dog at this moment. In that 2005 University of Massachusetts study, groups of black and white children were shown images from Sesame Street. In the crucial picture, a sick Cookie Monster languished in bed without any cookies, while Elmo stood nearby eating a cookie. “Who is eating cookies?” Jackson asked her test subjects, and all of them indicated Elmo. “Who be eating cookies?” Jackson then asked. The white kids replied that it was Elmo, while the black kids pointed to Cookie Monster. After all, it is the existential state of Cookie Monster to be eating cookies, while Elmo just happened to be eating a cookie at that moment. Cookie Monster, to those conversant in AAE, be eating cookies, whether he is eating cookies or not. The kids in Jackson’s experiment picked up on the subtle difference when they were as young as 5 or 6. Other features of AAE—a dialect individuals might move in and out of at will—include copula absence (the omission of certain forms of “to be,” as in “they angry” instead of “they are angry,” or the currently vogueish Twitter declaration “it me”) and the deletion of S’s after third person singular verbs. (Think “Hulk smash,” not “Hulk smashes.”) But the meaning of such variations is relatively transparent regardless of your comfort level with AAE. The habitual be seems slyer, not just a simple signifier of black speech (though it’s been used to that purpose) but a separate, specialized verb tense masquerading as a “standard” one. Gaelic, Jackson pointed out, also uses verb forms that distinguish between habitual action and currently occurring action. The habitual be be reminding us of the richness of English’s many dialects. *Correction, Dec. 3, 2015: This post originally misstated that Janice Jackson was affiliated with the University of Maryland. She was a doctorate student at the University of Massachusetts Amherst when she conducted the study.